A lot of my friends make fun of me for this BUT I have no shame. Somehow, a lot of things in my life all lead back to London Drugs. In general I spend too much time in the store but it’s fun? *shrugs* For those of you outside of Canada, London Drugs is a common drugstore in Western Canada that sells almost anything you could need for a household; dishes, batteries, Kleenex, toiletries, medicine, dried foods, seasonal items and holiday sweets, make-up and perfumes, games and appliances. You can develop photographs there, buy computers and cameras; the list goes on. One evening in a zombie-like vortex of London Drugs shopping, I ended up with a meat grinder. Practical right? I had survived 31 years of my life without one but in that moment it felt necessary. Twenty dollars seemed like a steal. “You get what you pay for!” I would agree with this statement. It’s not top of the line but it does the job, oh yeah, it’s a manual hand crank. Since purchasing it, I’ve made gnocchi a few times with it, duck and pork belly dumplings and most recently my own burgers. My partner doesn’t eat a lot of meat lately so I can usually be persuasive when I use ethical buzz words like, “Grass-fed, antibiotic and hormone-free, happy animals,” etc. I felt like making a simple but nice meal so I went for a quick jaunt down to one of my favourite local butchers that specialize in local and ethical meats. I bought some Organic Chuck that I got them to cube for me and a couple of generously marbled short ribs on the bone. I was reading that the perfect ratio for burgers is 70% leaner meat and 30% fattier meat. Chuck still has some connective tissue but not as much fat as short ribs. I cut the meat into manageable cubes and quickly threw them on a parchment-lined sheetpan in the freezer to firm up (makes it easier to grind). After about 10 minutes of elbow grease and bloody hands later, I formed the perfectly ground beef into patties, dimpled them, seasoned them judiciously and got to cooking them up; hard sear and no flipping until the edges caramelized. In a different pan I put a bit of butter, garlic and parsley and crisped up some rounds of bread to act as my bun for the burgers, open-faced style; fancy garlic toast if you will. 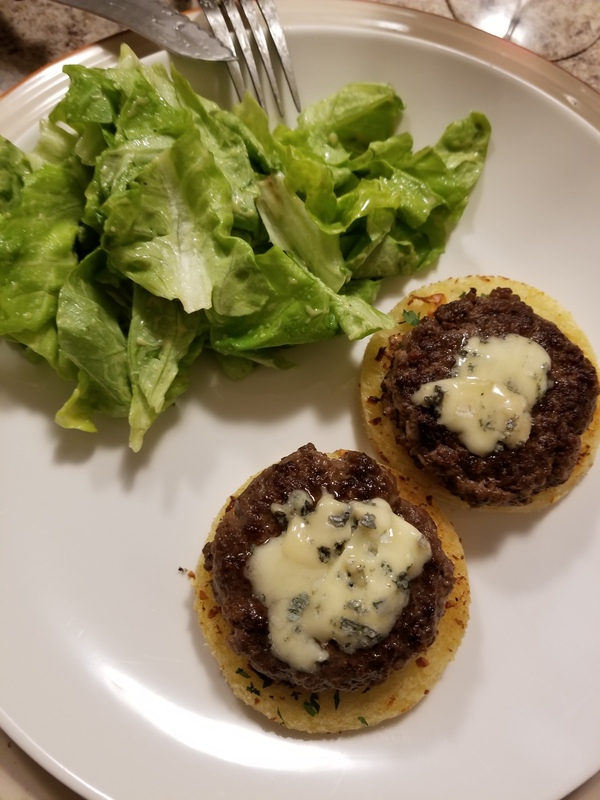 I topped these crispy and extra beefy burgers with some Quebec blue cheese here that I bought at Ottavio’s in Oak Bay here. A simple salad with greens and mustard vinaigrette and voila! Dinner is served. Next Simple Balsamic Vinaigrette !